Out of all of the pizza recipes so far I think this may be in the top two (2). These were incredible and would be so perfect for entertaining. Even the kiddos would be pleased with these cheesy, delicious bites. As you know I love perfectly portioned meals. Are they still considered portions if you eat 12 in on sitting? Questionable at best. Make the dough ahead of time for a super fast appetizer. I used one half of the recipe of Cheri's Favorite Pizza Dough. It turned out remarkably well. Preheat oven to 400°. While the oven is heating shape your dough by rolling into a long snake about 2" in diameter. Then roll it about ¼" thin with a rolling pin. Leave edges bare, and spoon a thin layer of marinara over dough, then layer with cheese, pepperoni, and onion. Using your hands begin to roll dough into a coil. Cut coil into ¾" pieces using a pizza cutter. 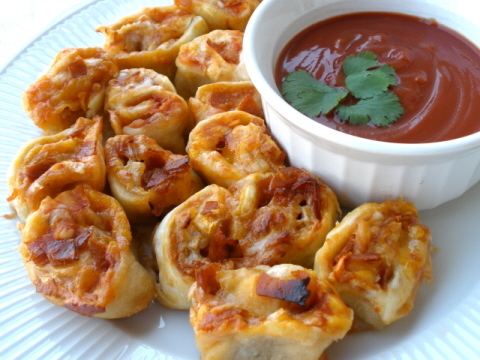 Place pizza rolls into olive oil greased baking dish. Place rolls so they are lightly touching. Bake in preheated oven for 20-22 minutes. Serve with warmed marinara for dipping. Yum, yum, yum-yum.